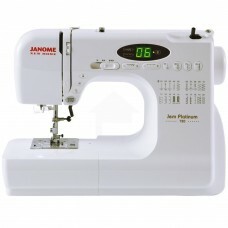 JNH Jem Platinum 720 Features: -4 Scroll selection keys with Stretch stitch adjustment.-4 Piece feed dog and horizontal full rotary hook.-De-clutch bobbin winder with built-in needle threader.-Thread cutter,start/stop button,speed control lever.-Needle up/down button,thread tension control and drop feed lever.-Snap-on foot conversion and electronic foot control.-Horizontal spool pin.-Free arm / flat bed convertible with carrying handle. Includes: -Hard cover included. Specifications: -20 Stitches with 2 one-step button holes.-Maximum zigzag stitch: 5mm W x 4mm L. Dimensions: -Lightweight: 12 lbs.